Publisher(s): William Morrow & Co.
Help us by clicking a link and adding any item to your cart at Amazon within 24 hours, and we will earn a small referral commission. Below are search results for A-Hunting We Will Go by Steven Kellogg at Amazon. You can visit Amazon to customize this search. Below are search results for AHunting We Will Go at Alibris. You can visit Alibris to customize this search. 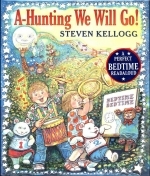 Below are search results for AHunting We Will Go by Steven Kellogg at AbeBooks. You can visit AbeBooks to customize this search. Below are search results for AHunting We Will Go audiobooks at iTunes. Browse iTunes to customize this search. Below are search results for AHunting We Will Go ebooks at Apple Books. For Camille Dutton, the past few weeks have been transformative in more ways than one. No longer shy and reserved, the still somewhat socially awkward book waitress has found a new purpose in life. JaxSynn, her Ice Demon lover, is now at her side as they prepare for the first of many dangerous hunts. Their prey? Hell-beasts that have crossed through Hell’s portal, wreaking havoc on an unsuspecting island town. In London, her team of Relic-gatherers, Derek, Arnie, and Mallory, must acquire the first of thirteen religious objects needed to close the Gate to Hell once and for all. Satan has different plans for the fractured team, however, and wastes no time exploiting the fierce weather for his wicked games. With relationships strained between Derek and Mallory, and a curious metamorphosis arising within JaxSynn, can Camille and the rest of the crew even hope to get the upper hand over evil? The Thanksgiving holiday and all it consisted of had taken its toll on Mattie, and she had quickly jumped on the idea of going back to the coast with Walt when he returned to the bear hunting he had put on hold to come home for the holiday. If you knew Walt, you knew what a sacrifice this was to him! But she thought being with her husband in the wild surroundings of eastern North Carolina, and being in on the hunts would be a refreshing break for her mind, body and soul, and she would come back home lively and energized and ready for the Christmas doings and celebrations. Mattie started to have misgivings about her decision when things became just as nerve rendering, or more so, with each day of her retreat. As early as the second day there she began to mourn her absence from the pre-holiday preparations back home; the familiar shops and cafes brightly adorned and reeking of the Christmas spirit. But most of all, she soon learned, she had forgotten the dangers of the forest and its inhabitants.